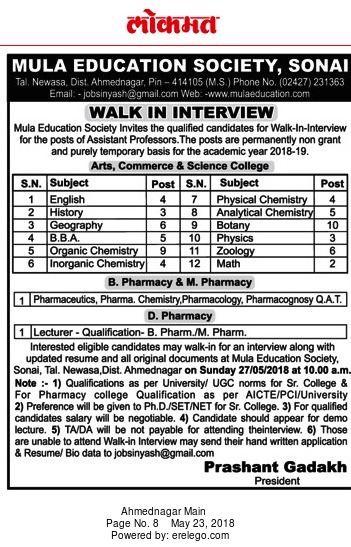 Mula Education Society, Sonai has advertised in LOKMAT newspaper for the recruitment of Assistant Professor job vacancies. Interested and eligible job aspirants are requested to appear walk in on 27th May 2018. Check out further more details below. About College: Mula Education Society , Sonai. perched on auspicious land of the river Mula basin , was established on January 31,1979.MES aimed at imparting education to the rural masses. Hon MLC Yashwantraoji Gadakh Patil ,the founder, envisioned a bright future for the rural students .As a result, MES made its first Endeavour by opening Mula Public School to disseminate education through English medium.